Types of Collaboration Tools | Collaboration Technology : Consolidated Technologies, Inc. Thanks to today’s workplace collaborative tools, productivity is no longer chained to a physical desk. The office can be anywhere you have an Internet connection, meetings held from the comfort of your home and tasks ticked off on one teamwide, real-time collaborative software suite. These tools help colleagues today be more communicative, more collaborative and more cooperative than ever. Yet what seems like a straightforward series of software and hardware is actually a web of ever-developing collaborative tech products in dozens of forms, each offering its own unique platforms, capabilities and benefits. What are the essential types of collaboration technology for today’s office? We’ve outlined a definitive guide of collaboration technology to help you determine which tools glitter and which are actually gold — all to better position your teams toward success. Collaborative technology refers to tools and systems designed to better facilitate group work, both in-office and remote. Also known as groupware, these pieces of technology trim the costs and time associated with facilitating group work, from designating roles and responsibilities to routing in-situ documents to checking and approving project parts. They allow for more intuitive and coordinated group problem solving across an entire team’s workflows. What Are Collaborative Methodologies and Techniques in the Workplace? The dominant collaboration methods in an office or workplace will be a reflection of the organization’s broader culture. Proximity refers to a team’s ability to connect easily and interface with one another, and therefore relay essential project-furthering information. Permissiveness, or openness, centers on how fluidly a team shares ideas, asks questions and seeks new insights and opinions. Finally, familiarity is the sense of intimacy and camaraderie shared by the group in relations to its work. The higher a team scores in proximity, permissiveness and familiarity, the more efficient their group work. Telecommunications allows groups to collaborate even when not in close physical proximity via voice, video and data-based technology. This means coordination and activity at times and in locations that otherwise would be difficult, if not impossible. Travel expenditures are reduced and the pool of subject-matter experts widens, strengthening overall work. Premise-based collaborative software is bought and installed onto individual desktops on a company’s network. These tools expand the shared project management functions and capacities of teams, allowing members to track and organize project tasks as well as locate important network files, make informational updates and message anyone with access to the on-site software. Software-as-a-service (SaaS) is the next iteration of on-premise software. Rather than installing software onto individual computers, an organization instead purchases a software subscription, which allows anyone to use that software regardless of location so long as they’regranted permission via your virtual private server (VPN). SaaS combines the team-enhancing communications of traditional proximity and two-way voice, video and data collaboration tools with the project management features of proprietary software, unlocking truecollaborative technology for the office. What Are the Types of Collaborative Software Tools? There are three software types, or three “C’s,” comprising today’s collaborative software tools. While each focuses on simplifying a particular aspect of group work — such as calendar sharing, meeting conferencing and document updating — together, these classifications of collaborative software technology open the door for borderless team project management. Communication technology is the first “C.” As its name suggests, communication software tools allow for messages, chat groups and conversations to be conducted between individuals and parties via the Internet, whether those parties are in different parts of the office or different parts of the world. Communication tools also tend to be unstructured. They do not require prior scheduling or calendar sharing to be effective — in fact, they’re not intended to be formally preemptive at all. Conferencing software allows two or more individuals to communicate with each other in real time, using Internet-based or cloud-based platforms. Conferencing software allows that same group of people to view a unified screen. It’s this second component distinguishing conferencing technology from sheer communications technology. Depending on the software used, conferencing technology allows for everyone to access, make changes and work on the unified screen all at once or for a single presenter to control screen movements and functions, such as during a presentation. Coordination technology rounds out the three main types of collaborative software. Arguably the most holistic of collaborative tools, coordination software is designed to integrate both teamwork and taskwork functions. In other words, they allow individuals and groups to connect interpersonally as well as coordinate work tasks and activities — making end-to-end workflow management simpler, unsiloed and more efficient. What Are the Two Dimensions of Collaborative Software? There are two key dimensions, or operational uses, for collaborative software — synchronous and asynchronous. Together, these two software dimensions define how a tool or technology can be used — that is, at what time, in what place and by how many people. All communication, conferencing or coordination software will either be synchronous or asynchronous. Let’s break these software dimensions down further. Synchronous collaboration programs work in real-time, meaning two or more people are communicating, reviewing and collaborating on the same platform at once. There are no lags or delays in responses regardless of the communicator’s location. You can expect to receive an answer or hear a solution to a particular question, prompt or task almost as soon as you relay it. Synchronous Software Pros: Real-time communication is expedient and hyper-efficient. It allows users to get the feedback, information or files they need when they need them. This transforms org-wide communication into a process that’s easier, clearer, more purposeful and arguably more productive. Synchronous Software Cons: Real-time communication platforms may lack documentation or future cross-referencing capabilities. These platforms can also be difficult for high-order, abstract or value-driven conversations compared to task-centered ones, plus can grow complicated and disorganized if involving large groups of people. Asynchronous software makes up the other category of today’s collaborative tools. Unlike the immediate interactions that define real-time software, asynchronous platforms are not designed for instantaneous tasks or activities. Brief waiting periods between when someone initiates interaction and when that interaction is satisfied is not only expected, it’s often beneficial. Asynchronous Software Pros: Asynchronous software allows for broadened perspectives or fresh expertise to be brought into a project. Asynchronous platforms are often more documentable than real-time communications, plus allow more time for individuals to reflect before contributing a response. Asynchronous Software Cons: Long delays between questions and answers may bottleneck tasks and hurt team collaboration, which is the very thing you’re trying to enhance. Asynchronous communication can also be complicated by things like time zones or mismatched worker schedules, resulting in even longer communication limbos. What Are the Classifications of Collaborative Tools? Today’s suite of collaborative software can be classified even further, allowing organizations to adopt the tools and technologies truly suited for their type of work. All software must “go” somewhere — that is, it must be installed or set up someplace where it will be accessible to your workforce. How that software is set up, and subsequently how approved users can log in and use it, is part of a broader IT concern called hosting. On-premise collaboration software: On-premise software is installed and managed in-house, on your own physical servers. On-premise software is typically, though not always, only accessible while on hardware within your office building. Web-hosted collaboration software: Both real-time and asynchronous collaboration software can be web-hosted, meaning all software data and applications are stored on a web server. That server can be shared, dedicated or even a VPN depending on the size and scale of your organization. Cloud-hosted collaboration software: Some software can be stored and operated in the cloud, which uses cloud-computing technology to deliver software and applications over the Internet, not through your physical servers. 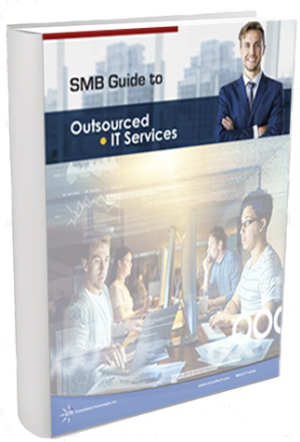 Management of cloud-hosted software is also typically outsourced. Your organization doesn’t have to oversee the software’s updates and security, leaving those tasks to your partner cloud provider. All your employees need is a device with an Internet connection, and they can access the piece of collaborative software required to complete their work. Collaborative hardware: Some types of collaboration tools will require specialty hardware to function fully. One example of this would be VoIP using an IP-enhanced phone to make conference calls, transcribe voicemails to text and so on. Document management software: To assist in the creation, edits, design, review and approval of files, plus serve as a central repository for employees to access those documents on any device. Time-management software: Digital calendars with scheduling, notifications, event alerts and even payroll capabilities. Project management tools: Workflow software to oversee a project’s end-to-end execution across team members’ responsibilities and activities. Information-sharing software: Notification-based applications where individuals can send updates and alerts after they’ve completed a task or checked off a project part, as well as route questions or messages to appropriate personnel. Knowledge management and creation tools: A single project database source with bookmark saving and tagging, data entry, data querying for quick searches and information-based inputs. 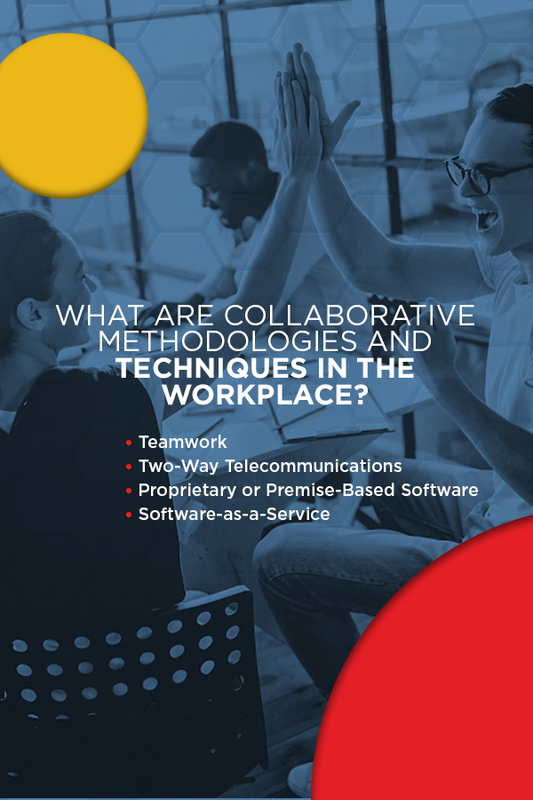 Collaboration software is also widely classified according to the three C’s described in the previous section — communication, conferencing and coordination. What Are Other Types of Collaborative Tools? Video conferencing, screen sharing, employee scheduling, project managing, spreadsheet programming — the list of collaborative enterprise software is long and diverse yet often classified by their primary functions. Yet what about those pieces of software that blend activities, or perhaps don’t fall neatly into one collaborative category? We’ve compiled a few of these types of communication tools as well. Ever been forced to manually, line by line, match two different versions of a document? Three versions? Even more? With document synchronization software, tracing the breadcrumb trail of document tweaks, tailorings, additions or deletions takes only a few clicks. Plus, these pieces of software synthesize separate documents into one fresh sheet based on directory inputs, saving teams from redundantly creating documents. Whiteboarding software takes the meeting room wall staple from the physical to the digital. It’s a dream tool for remote teams during a conference video call. Colleagues can take turns drawing graphics, plotting charts, mapping concepts or even jotting down quick notes on a shared screen, then save or erase those images once the next person needs the board. Share pictures and even videos of your screen using communication software that turns screengrabs into condensed links. This collaborative feature makes both real-time and asynchronous troubleshooting easier. Imagine you’re having problems saving work in your team’s new document-management software. You can send a video illustrating your process difficulties to a team member, who can then send you a link of their own with a step-by-step, visual tutorial. No more complicated or difficult-to-follow written directions or long-chain responses. Team members sprinkled remotely can use financial planning, accounting (FP&A) and other budgeting software to generate and send invoices, track expenditures, view outgoing payment deadlines, submit time sheets, approve reimbursement reports and more, all from one platform. It’s no secret — businesses today must manage their technology before technology manages them, causing more headaches than the initial collaboration task they were meant to solve. Consolidated Technologies, Inc. is here to help you better manage the ever-changing, exponentially fast world of today’s — and tomorrow’s — technology. We offer unified communications and managed IT services for small and mid-sized companies who know there’s a better way — find out how. Contact our system experts to see how managed software services can grant your wish for better office group work today.